Free games: Win a copy of Ubisoft’s thrilling cultist shooter Far Cry 5 on PC! What about Far Cry 5 appeals to you most? Perhaps it’s the dusty ranges populated with hay bales and red barrels that are ripe for turning into a shooting range. Woof! Oh, maybe it’s Boomer, that best of boys, playing fetch with your enemies’ rifles. Or it could be the helicopters, pick-up trucks, and ATVs you can use to tear across the acres of farmland. Whatever it is, there’s a lot on offer in Far Cry 5, and we want to get it in your eager hands. That’s why we’re giving away five Uplay keys for the PC version. Find out how you can win one below. 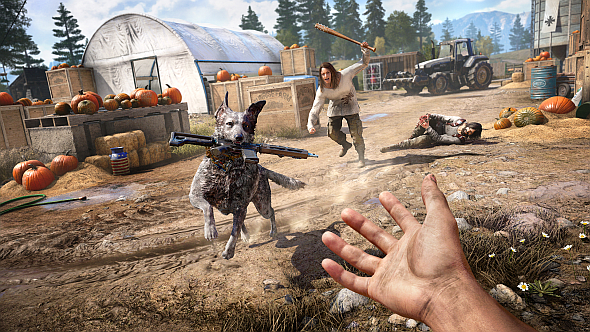 Far Cry 5 is the latest in Ubisoft’s open-world shooter series, but this time it isn’t about blowing up everything you can see in some exotic location – it’s set in Hope County, Montana. As a cop with a warrant to arrest the leader of a doomsday cult known as Eden’s Gate, you travel out to the rural American landscape, cuffs at the ready. Joseph Seed, the Messiah-like man you’re after, gives himself up easily enough, but it’s all part of his grander plan. His followers see his arrest as a signal to kick off, leaving you stranded in their territory, without backup, only a gun at your side. Better watch out for those cultists – oh, and don’t let those turkeys go easy, either. From there you can expect bullets to fly, curses to be spat at you, and plenty of good ol’ American shootouts. There’s even time for a spot of fishing. Fortunately, you wont’ have to be lonely for long, as the game’s Guns and Fangs for Hire systems let you bring in the locals for support. And, yes, one of them is Boomer. Did we mention he’s a very good boy? Now, let’s get you entered in our competition so you can hopefully win a copy of Far Cry 5. All you need to do is enter via the widget below. We’ll need your email address so we can send you a code upon winning – we won’t send you spam, we promise. Please read ourterms and conditionsbefore you enter.